Well, TERA fans, you know what they say… You can’t get something for nothing. 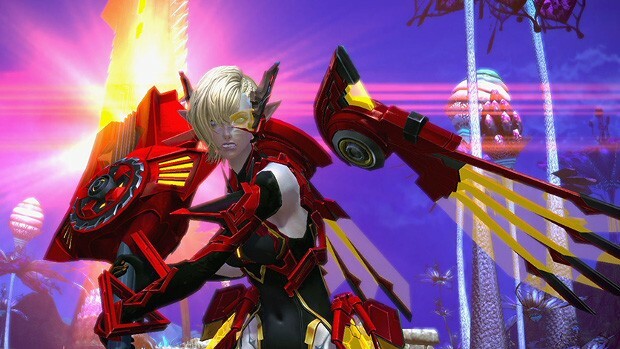 Such is the case with the new, kinda cool looking, mechanical weapon skins making their way to TERA. They’ll be available in both Loot Boxes and Smart Boxes that range in price from 195 EMP to 3,995 EMP. Guaranteed to contain 400 Metamorphic Emblems. May also contain a Turbocharged Crimson smart box, dyad niveot structures, golden or silver talents, more emblems, or other consumables. May also contain a Turbocharged Chrome smart box, dyad niveot structures, golden or silver talents, more emblems, or other consumables. Contains a Supercharged Scarlet weapon skin. Contains a Supercharged Silver weapon skin. Contains a Flight Suit costume smart box, Red Airfoil Wings accessory (for female characters only), Red Flight Lens accessory (for female characters only), and a Supercharged Scarlet weapon skin smart box. Contains a Flight Suit costume smart box, Red Flight Helmet accessory (for male characters only), and a Supercharged Scarlet weapon skin smart box. All boxes can be purchased directly from the TERA store.